Take control of the USA and USSR armies and defend your toy box in this tower defense style game. Place your base turrets in the designated spots and destroy the enemy before it enters your toy box. While they will man themselves if left alone you also have the ability to get down to a third-person level and take over a turret and be more involved in actually destroying the enemy. Keep a close eye on the flag in the upper left hand corner of the screen, it will show your health and will become more ragged as enemies get past your defenses. Careful - letting too many enemies in your toy box will lead to disaster! From city streets to a carrier ship the almost fully destructible terrain varies but there's always pieces of scenery on the edges of the playing area that really bring out the idea that it's just a bunch of toys in some kids room. 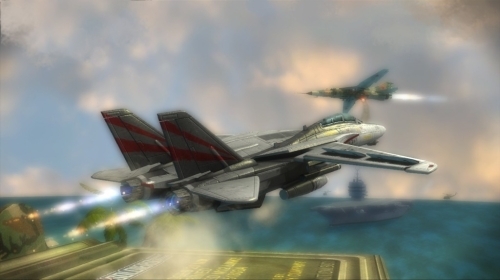 Campaign mode kicks off with a brief basic training level, that gives the player a feel for some of the weapons available before facing oncoming waves of enemies. There are a large assortment of air and land vehicles available for each side. Whether they're driven on land or flown in the air they all have one thing in common, batteries. Another feature that reminds us that we're still just in the toy box. Generally, players have enough battery power to get a decent amount of destruction in before the vehicle expires, but additional batteries are scattered throughout each map as well. Fighting against the tanks and the helicopters you've got some selection as far as turrets go and each of them are able to be upgraded to three different levels. Five of them are legitimate weapons you've probably seen in other war games; anti-air, anti-tank, artillery, machine gun and mortar. The sixth one is sort of a wild card. The toy soldiers have been busy creating their very own makeshift weapons using bug spray, hair spray and fireworks. One major thing to keep in mind, like with all tower defense games, is money. You need it. You'll start with enough to build a turret or two but in order to build more you'll have to start killing people. At the top center of the screen is a list of upcoming waves of the opposition. It's generally a good idea to pay attention to this and place a corresponding turret as appropriate. While most of the weapons can cause damage to anything coming at you, choosing the right turret can make or break a level. An artillery turret, for example, won't do much against a fighter jet, but an anti-air turret will get the job done. Fortunately, a rewind feature allows the player to go back to a prior wave, and try again. In addition, waves can be called early, shaving off a bit of each map's completion time, and gaining extra aggression points. Every couple waves a red star unit will appear. Essentially, it's a member of the enemy and there's a big red star over his head but killing him is one way to activate the barrage (getting consecutive kills and reaching turbocharge mode and keeping up with the consecutive kills is the other way). The only catch is that you have to be in control of the turret base that kills the red star unit, it won't count otherwise. Once he's killed though, you'll randomly be awarded an attack barrage. Everything from air strikes to nukes are available as well as a commando, but all one time things that only last for a brief moment of time. An action star straight out of the 80's (we're talking Rambo style) will fall from the sky in some packaging and once he lands, well, he's indestructible. He's got a rocket launcher in one hand and a mini gun in the other and using him you're back down in third-person view running around destroying stuff and getting single shot kills on everything. Once you get through all the waves and the final 'boss' there will be a stats page. On it you'll receive medals and ribbons depending on how well you did and if you accomplished the secondary challenges within a level. 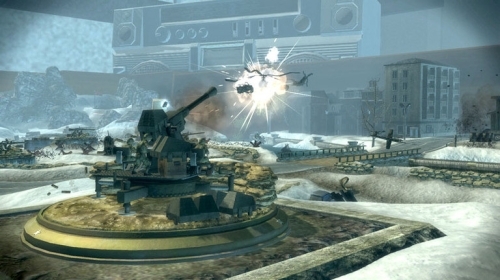 While Toy Soldiers: Cold War has a suitably lengthy single player mode, it also has survival and versus modes that can be played split-screen or over Xbox Live. They've also included a few mini games for you to test your skills out on. A few of them you'll of already played if you completed basic training but there's a few others that take some of the best parts of the campaign and let you play them on there own. Among the six available mini games, Thread the Needle - a shoot the rocket through the hole challenge, and Flyswatter - where the player is tasked to kill as many flies as possible in 60 seconds, are our personal favorites. All told, Toy Soldiers: Cold War is a worthy sequel to the first title. If tower defense style gameplay and stylized action ripped right out of an 80s flick (who does the commando remind you of? -Ed.) are for you, this game will prove endlessly entertaining, and is well worth its 1200 Microsoft Points price tag. More exciting than most tower defense games, but things do get repetitive at times. 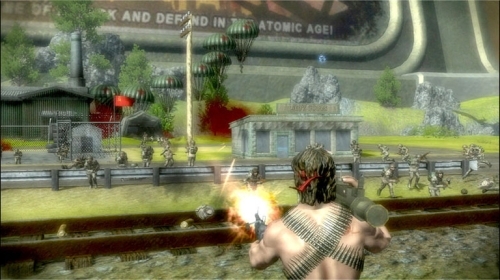 Numerous mini games and multiplayer modes ensure ample replayability. A predictable mix of gunfire and explosions. The addition of the commando's shouting is a nice touch. Deliberately plasticized looking visuals, always with a smooth framerate. Simple and well implemented. Constructing, repairing, and upgrading turrets is a snap. Toy Soldiers: Cold War is a ton of fun to play and looks sharp. A great tower defense game hybrid, that does not disappoint. Winter Spectacular 2.0 - Day Seven: Winner's Choice!